Thanks for all the great entries so far! Less than four hours left to post your submission-- I'll be deciding the two (three?) winners tonight and posting in the morning. 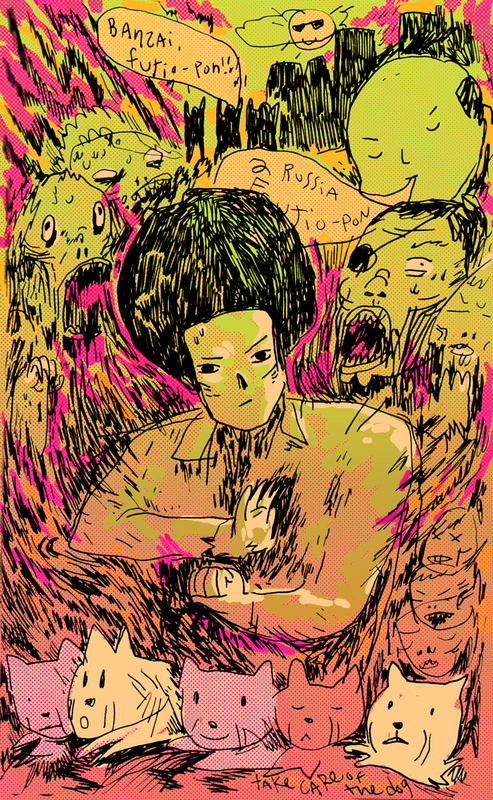 + Tokyo Zombie feature column on io9! Over at Gawker's Science Fiction blog, io9, columnist Lisa Katayama (of TOKYOMANGO fame) has written a great introduction to both our book and the Sakichi Sato film. For the article, Lisa interviewed me earlier this week about the manga. this comic looks amazing. i have to get my hands on a copy or else!!! Glad to hear it! Copies should be available via comic shops, Amazon or direct from Last Gasp. so i finally purchased this yesterday. it was incredibly entertaining. you guys are princes for translating this. hanakuma is a new favourite of mine. @jake: YES! I'm really glad that you got the book and enjoyed it... Here's to more Hanakuma in the future hopefully!